A tender, flavorful, and expensive cut of beef taken from the rib section. A full rib roast (ribs 6 through 12) is quite large so it is often cut into two separate roasts known as the first cut rib roast and the second cut rib roast. 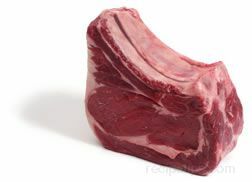 The first cut rib roast, also known as the small end rib roast, includes ribs 9 or 10 through 12 and is next to the loin. Because of its proximity to the loin section, it is very tender. The second cut rib roast, also known as the large end rib roast, includes ribs 6 through 8 or 9 and is next to the chuck. It is very tender, but because of its proximity to the chuck section, it is not quite as tender as the small end roast. Rib roasts have good marbling, which adds flavor and juiciness to the meat when cooked. When determining the proper size roast required for a specific number of people, you can figure that each rib will feed two people. A two rib roast will feed four people, a three rib roast will feed six people, and so on. Rib roasts that include the bones are also know as standing rib roasts. When the rib roast has been boned, rolled, and tied it is known as a rolled rib roast.